HOUSTON – Children’s Memorial Hermann Hospital and Cord Blood Registry® (CBR) are launching the first FDA-approved, Phase I safety study on the use of cord blood stem cells to treat children with sensorineural hearing loss. The study, which will use patients’ stem cells from their own stored umbilical cord blood, is the first-of-its-kind, and has the potential to restore hearing. This follows evidence from published laboratory studies that cord blood helps repair damaged organs in the inner ear. The year-long study will follow 10 children, ages 6 weeks to 18 months, who have sustained post-birth hearing loss. The Principal Investigator is Samer Fakhri, M.D., surgeon at Memorial Hermann-Texas Medical Center and associate professor and program director in the Department of Otorhinolaryngology – Head & Neck Surgery at UTHealth. Linda Baumgartner, MS, CCC-SLP, Auditory-Verbal Therapist, is a co-investigator. Researchers will obtain and process the patients’ stored cord blood for treatment. The cells then will be given to the patients via IV infusion and patients will be observed for several hours in the hospital. Patients will return to the hospital to repeat all tests except the MRI at one month and one year and all tests with an MRI at six months. Since more infants are surviving premature birth, physicians and researchers are seeing a rising number of very young children with significant hearing loss. About 15 percent of children in the U.S. also suffer from low-frequency or high-frequency hearing loss that can impact the child’s speech, language and social development and can increase their risk of developing learning disabilities, according to Dr. Fakhri. The study is supported by CBR and TIRR Foundation. 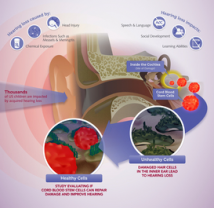 For information on participation in the study, visit www.cordblood.com/hearingloss.